Alcotec's 24 Hour Turbo yeast is one of the most trusted products on the market for high alcohol production. It is a proprietary mixture of yeast and nutrients that will yield a 14% alcohol content in 24 hours under normal circumstances. 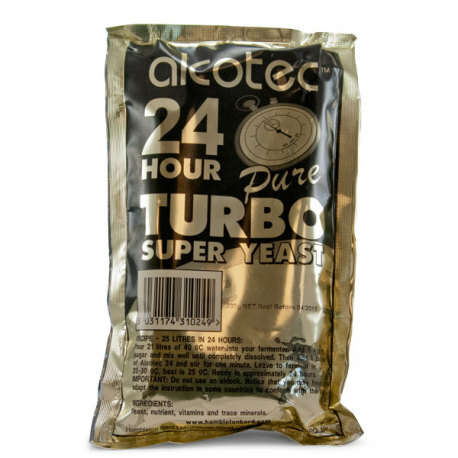 Alcotec 24 Hour Turbo Yeast works best and makes the most consistent product at 77°F (25°C). Fermentations can be extremely vigorous, so it is suggested to either use a blowoff tube or not use an airlock at all until fermentation slows.